WASHINGTON, D.C. -- As Congress continues to come under fire for seeming inaction on hot-button issues like repeal of the Affordable Care Act, congressional approval remained subdued in September, at 16%. The last time Congress approval was lower was in July 2016, at 13%. President Donald Trump's deal with Democratic leaders in Congress on the debt ceiling and hurricane relief funds was struck just before this Sept. 6-10 survey was conducted and doesn't appear to have had any effect on congressional approval this month. Congress was in recess during much of August and has been back in session since last week. Americans' stable opinions of Congress in September may reflect the recess and the lack of activity during August. Approval of Congress hit a recent "peak" of 28% in February, the first reading after the Republican Party gained control of the legislative and the executive branches following Trump's inauguration. But rank-and-file Republicans' approval fell, reaching 16% in August, after congressional Republicans failed in their most recent attempt to repeal the Affordable Care Act. Republicans' approval of Congress was low in September, at 18%, similar to their 16% rating in August but down significantly from 50% in February after Trump's inauguration. 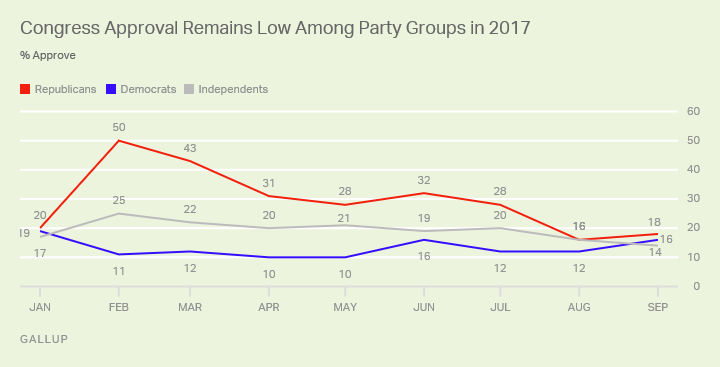 While that peak of 50% for 2017 was short-lived, it wasn't until last month that Republican approval fell back in step with that of Democrats and independents. The lack of a Republican lead on this measure is remarkable in light of Republicans' control of both houses of Congress. Historically, when one party controls both houses, its supporters rate the institution much more positively than other Americans do. However, at the moment, all party groups give Congress similarly dismal ratings. Republicans' approval of Congress may have fluctuated throughout 2017, but Democrats' has been more consistent -- ranging from 10% to 19%, including 16% in September. Independents' approval of Congress this year has ranged from the current 14% to 25% in February. Congress has seen little major legislative success so far this year. Legislation that has failed to make its way out of Congress includes a replacement for the Affordable Care Act, an infrastructure bill and funding for a wall along the United States' southern border. Congress now appears to be turning to the Deferred Action for Childhood Arrivals (DACA) immigration program, after Trump's announcement that he is giving Congress six months to come up with legislation addressing it; tax reform; and funding children's healthcare. Bills addressing DACA, tax reform and infrastructure could result in Americans rewarding Congress with higher approval ratings. But with partisanship now the norm in Congress, and little sign of it abating, it may be quite some time before Congress approval significantly improves. 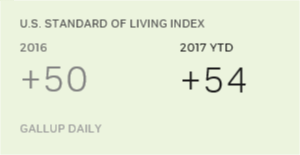 Americans are more positive about their standard of living this year than they have been for at least the past nine years. Sen. John McCain's 58% favorable rating is his best since shortly after the 2008 presidential election, thanks mostly to improved opinions among Democrats.